Mark Your Calendars, Lynda Blackman Lowery will be Here Feb 27th and 28th! Lynda Blackmon Lowery began her fight for civil rights in Selma, when activists organized Lowery and other area children and teenagers to participate in the civil rights movement. In the front lines of the struggle, the young Lowery was the youngest marcher to walk every step of the successful infamous March from Selma to Montgomery. A fascinating story that all should hear! 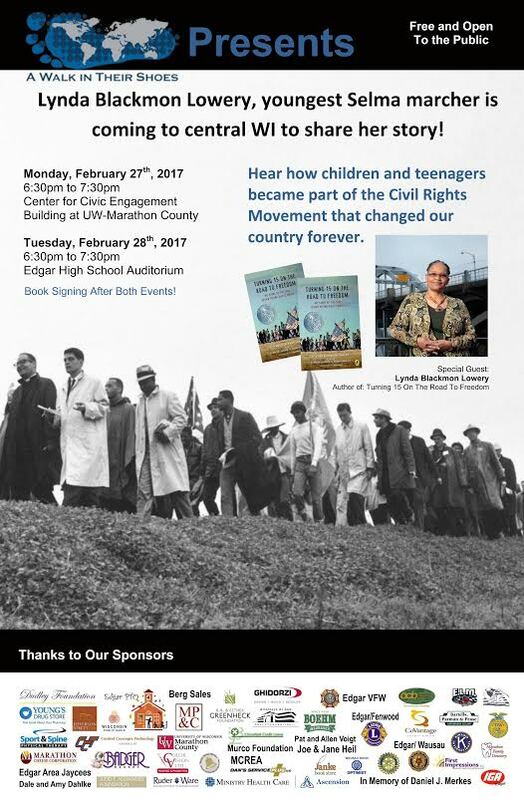 Monday February 27th at UWMC (Center for Civic Engagement) from 6:30pm to 7:30pm with a book signing afterwards. Tuesday February 28th at Edgar High School Auditorium from 6:30pm to 7:30pm with a book signing afterwards. A Walk in Their Shoes presents a critical WWII story that must not be forgotten. center around WWII and the injustice our government bestowed upon Japanese-Americans after the bombing of Pearl Harbor. Following the bombing of Pearl Harbor, Japanese Americans were suspected of spying for the enemy. Over 120,000 people on the West Coast were rounded up; forced to leave homes and businesses. Fathers were arrested by the FBI, newspaper headlines throughout the warned people not to trust Japanese Americans, and property and businesses were lost as our government sent them hundreds of miles away to internment camps. Their only crime—being of Japanese descent. 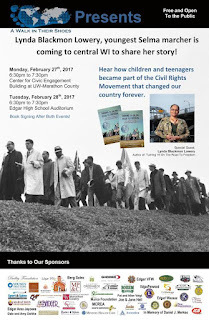 Kerry Yo Nakagawa, Howard Zenimura and Tets Furukawa will share this piece of American history with community members and the students throughout Marathon County. Students from Edgar, Medford, Wausau East High School, Horace Mann and John Muir Middle Schools, as well as EEA and EGL will also participate in presentations. James Veninga Auditorium at the WIPPS Center. ● Tuesday, March 22, 2016 at 6:30 PM at Edgar High School. Kerry Yo Nakagawa is an accomplished writer, director, and the founder and director for the non-profit Nisei Baseball Research Project (NBRP). Accompanying him will be Mr. Zenimura and Mr. Furukawa to help with the presentations. Both are former camp internees and baseball players for the Gila River Arizona camp baseball team. Their families were interned on the Gila River Indian Reservation. Baseball at Gila River gave Japanese Americans a sense of pride, hope, and normalcy. After the war the camps were closed, it was still a decades-long journey for healing, an apology, and recognition that such indignities must never happen again to other groups in America. Through the efforts of Mr. Kerry Yo Nakagawa and his organization, people throughout America can hear and these stories so they are not forgotten. facebook.com/awalkintheirshoes or contact Colin Hanson at 715-560-8933. The theme this fall for A Walk in Their Shoes has been Salute to Veterans. Our first event, the Traveling Vietnam Memorial Wall visitation in Edgar, was a HUGE success, thanks to all our sponsors, volunteers, the weather, and most importantly our veterans for making this the greatest country on Earth! Our second Salute to Veterans event is scheduled for Veteran’s Day 2015.
story of WWII with the community. Rick Beyer, the historian, will be sending one of the inflatable tanks to be on display as he and two veterans of The Ghost Army give their presentations to area students, school staff, and community members. The Ghost Army of World War II describes the highly imaginative and daring maneuver that helped open the way for the final drive to Germany. There will be two free community presentations thanks to our sponsors.  Wednesday, November 11, 2015 from 6:30pm to 7:30pm in the Center for Civic Engagement Building at UW Marathon County. John Jarvie served in the 603rd Camouflage Engineers, the visual deception arm of The Ghost Army. An art student who attended Cooper Union before the war, Jarvie spent thirty years as an art director for Fairchild Publications, owner of Women’s Wear Daily, supervising a staff of artists and writers. He is retired and lives in Kearny, New Jersey. Gazo Nemeth served in the Signal Company Special, the radio deception arm of The Ghost Army. After the war he spent 37 years as a machinist in Ohio and became commander of a local VFW Post. Nemeth retired to Florida, where he re-invented himself first as a census taker, then as a courier for a furniture store. He retired (again) at age 87 and lives in Fort Myers. For more information about this event, contact Colin Hanson at chanson@gapps.edgar.k12.wi.us or call 715-560-8933. Celebrate Veteran’s Day with the moving story of the true story of Triple Nickles, America’s first black paratroopers. As WWII began, the U.S. military mirrored our country—it was highly segregated and black soldiers were limited in the roles they could fill. One soldier, Sergeant Walter Morris, decided to help his troops be more than simple supporters of the war effort. Guarding the paratrooper training facility at Fort Benning Georgia, Morris began taking his troops through the same rigorous training as white paratroopers. He instilled pride in his men and soon caught the eye of those in power. The 555th Parachute Infantry Company was commissioned, with Morris as first sergeant.